The bright images on these finely engraved patriotic playing cards with a military theme are coloured with stencils. The uniforms are coloured in mainly green and blue, and the Kings are not actually wearing their crowns. The King of Acorns is supposed to represent Crown Prince Otto I; the King of Leaves is Maximilian II; the King of Bells is Ludwig II; the King of Hearts is Ludwig I wearing a general's uniform. 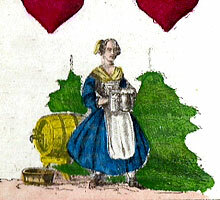 The court cards are all male, but some of the numeral cards depict women as well as military objects. This appears to be a later edition produced after 1879. Above: German-suited "Bayerische Militärkarte" (Bavarian Military Cards) manufactured by Johann Conrad Jegel (1791-1837), 36 cards, single-ended, stencil coloured, 10.4 x 5.8 cm. The Two of Hearts has a tax stamp with a double-headed eagle and the inscription "Deutsches Reich - Dreissig Pf. No.52". The back is a cross-grid pattern. Images courtesy Rod Starling. • See also: Historical Deck made by Johann Conrad Jegel.